It took me a while to settle on a name for the blog, but when “More Than Trends” finally rose out of the pages and pages of brainstorming and vision casting, it stuck. The name resonated with me on multiple levels. Not only did it fit with the concept that style should be personal and not driven by what everyone else is wearing or just made up of what’s in season and on trend, but it aligned with the layer of depth I wanted this blog to have. My goal is for More Than Trends to be more than just another one of those blogs about clothes. I want it to be a source of inspiration to girls and ladies alike, not just feed materialism. Which brings us to the first, of hopefully many, Woman Wednesday’s. These recurring posts will each feature a strong, inspirational woman. As we all know, inspiration can come from an array of sources and stir us in different ways. And with the mass volume of knowledge and access we have at our fingertips through the technology of today, it’s virtually never-ending. There’s always more to learn and discover. And when it comes to inspirational women, that list too is endless. From the mother or grandmother who raised you, to the Rosa Parks of the history books, to the celebrity who uses who platform to try and make the world a better place, to the fashion icon that sticks to her guns and does her own thing, to the local boutique owner who strives to help women see themselves as beautiful, the inspiration is plentiful. 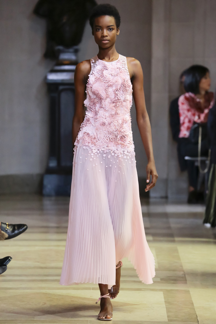 One, It’s fashion week, and her Spring 2016 Ready to Wear collection was one of my favorites. You can say that style doesn’t matter, and to an extent, you would be right. Style in and of itself can be kind empty, pointless, and meaningless. But that’s only if you let it. You see style can also be tool. It can say things you can’t say with just words. It can aid or hinder in communication and persuasion. It can make an instant impression—positive or negative—and be the deciding factor in a job interview. It can serve as a projection of self-worth, attracting or repelling certain types of people. It can be a creative and expressive outlet used to highlight your artistic flare and set you apart. Like any tool, you just have to use style correctly to get the most of it and the right results. Style Application: Sometime this week, take an objective look in the mirror to gain insight into the image you project. You’ll know if you’re doing the real you justice. And don’t worry. If you’re not there yet, with a little effort and time, you will be.